When the material, together with the conveying air, enters the collection container, most particles are separated out, due to a drop in velocity. A small amount of fine particles follow the air to the filter(s) where they are collected and prevented from entering the vacuum pump. The clean air continues through the vacuum pump and exhausted. 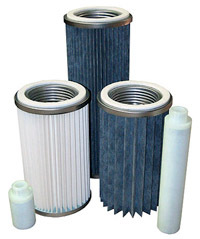 The filter material used can be of a number of choices depending on specific applications, including stainless steel, plastic (polyethylene), and HEPA filters.